bonus match. Argenis beat Dizzy with a moonsault. Joe Lider & Crazy Boy asked Alebrije, Cuije and Atomic Boy to join the Mexican Powers, and they said Yes! And then they won, Atomic Boy beating apache. Steve Pain's TV debut. Fenix beat Gladiador with a tornillo. Halloween replaced Eita (WWL). Toscano pinned Halloween. Parka Negra fouled Parka, and seem to get away with it, but the fans convinced Piero to call the DQ. Canek was the unadvertised surprised. Psycho Circus still won, Psycho Clown frog splashing Silver King. Apache super powerbomb on Nino de Ebano for the win. Texano came to the ring and attacked the tecnicos after the match for no particular reason. Texano brought Hijo del Tirantes to the ring, beat up Lucky Boy (who did not challenge him), pinned him with Tirantes counting three, and then declared he had just defended his title. Psycho Clown came to the ring to challenge Texano Jr., saying he'd beat him in the semimain first. Jack 630 senton on Eterno. Murder pinned Mascara with a top rope splash. Texano pointed out he was not beat, so no title shot for Psycho Clown (or anyone else.) Psycho swore he'd get the title from Texano. Cibernetico unmasked before entering the ring. He's back to short hair. Perro fouled Cibernetico; initial reports said Perro got away with it, but the AAA recaps says Cibernetico got the win by DQ. Dizzy replaced Apache. Nino frog splashed an unmasked Gladiador for the win. Halloween & Mary Apache came in as champions. Tirantes helped them, but took Drago's green mist in his face and was kicked out of the ring by Faby Apache. Drago pinned Halloween and Piero ran in to count. Mary & Halloween fall on their first defense. Drago & Faby Apache are 12th champions. Mary broke up with Halloween post match. Eita showed. Ozz Driver on Daga again. Ozz again asked for a title shot, and Daga again said no. 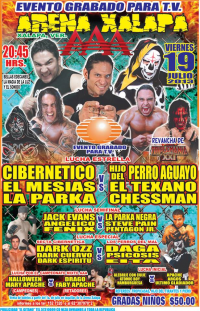 Chessman replaced Parka Negra. Fenix beat Steve Pain. Money thrown in the ring. 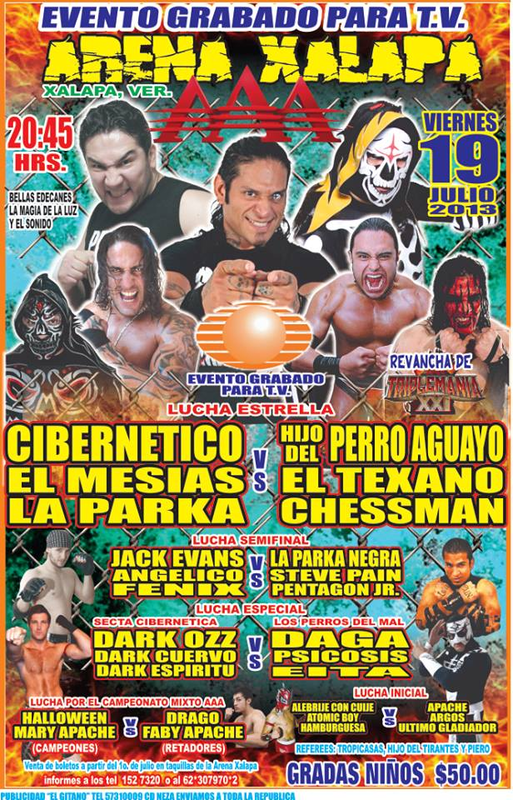 Parka Negra replaced Chessman. Cibernetico chokeslammed Perro for the win.